Obituary – Hentges, Iris “Lavaun” (McGill) « Perry High School Alumni Association, Inc.
Iris Lavaun McGill Hentges, age 82, passed away November 28, 2007 at her home in Gainesville, Florida. She was born August 27, 1925, to Horace S. and Fynes (Fleming) McGill, and reared in Oklahoma. She received a Public School Teachers certificate at 18 years of age and taught elementary schools doing World War II. She was a member of University of Wisconsin Dames and earned a PHT (Pushing Hubby Through). She moved to Gainesville from Madison, Wisconsin in 1952. 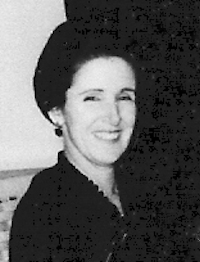 She was an Alachua County Deputy Tax Assessor, was in charge of Multiple Listing for Alachua County Board of Realtors, was awarded Life Membership in Gainesville Garden Club and Women of First Presbyterian Church, volunteered in Surgical Waiting Room as member of Alachua General Hospital Auxiliary, was chairman of Project for Thornwell Home for Children in Clinton, S.C. for over 20 years and was a Preschool teacher at First Presbyterian Church for over 20 years. In spite of health problems throughout her life, she felt blessed and truly believed that God placed the right people and opportunities in her life at the right times. Lavaun is survived by her husband of 62 years, Dr. James F. Hentges Jr.; sister Arlene Purcell, Oklahoma City, OK; cousin Dorothy Jane Manning, Tulsa, OK; three sons and their spouses Douglas (Shirley) of Perry, OK, Eric James (Sue) of Annandale, VA, Kurt William (Judy) of Alachua, FL; six grandchildren and three great grandchildren. The family will receive friends at a reception in Gordon Hall following a memorial service at First Presbyterian Church on Saturday December 1 at 10AM with Dr. Robert Shettler officiating. Burial will be private at Forest Meadows Central Cemetery. The family requests that in lieu of flowers, contributions can be mailed to Thornwell Home for Children, 302 South Brood St. Clinton, SC 29325-0060.